If there is one tree that most non-Californians identify with this state, it is certainly the coast redwood (Sequoia sempervirens) (fig. 77). These giant trees, famous for their size and longevity, form dark, primordial groves in moist valleys and canyons, and large ferns and a lush understory suggest a different, earlier time. Big Sur is the southern stronghold of California's redwood forest, and the species reaches its southern distributional limit about 2.5 km (1.5 mi) from the Salmon Creek drainage in southern Big Sur. From this point, the redwood forest stretches north 725 km (450 mi) just across the California-Oregon border. The trees grow in the narrow belt of fog that hugs the California coast and are rarely found more than 48-64 km (30-40 mi) inland from the Pacific. Redwoods have not always been restricted to this foggy belt of maritime California. Fossil evidence indicates that these trees and related plants were once widespread throughout the northern hemisphere, including Greenland, Europe, and Asia, about 50 million years ago. Climatic conditions then, even in the far north, were similar to the mild temperatures and high humidity seen today along the northern Pacific coast. In fact, a closely related species once thought to be extinct and known only from the fossil record was discovered in a remote area of China. However, due to the changing climate, says botanist Robert Ornduff, the coast redwood "should be considered a species that is on the way out in an evolutionary sense." The redwood's distribution in Big Sur reflects this trend and is more patchy than that of the redwood forests to the north. The trees usually occupy the steep coastal canyons where summer fog is channeled. They have been recorded growing at elevations as high as 1100 m (3600 ft) and occur less frequently on the north-facing slopes of the interior valleys. The redwood is a water-loving species and is thus restricted to areas of ample moisture. Many of the creeks flowing through the redwood-filled canyons dry up during the summer, but the summer fog supplies important supplementary moisture to the trees. The fog not only lowers temperature and increases humidity, but it also condenses on the flat needles of the redwoods and falls to the ground as fog drip. Studies in northern California have found that fog drip can add as much as 26 cm (10 in.) of precipitation to the annual total in redwood forests. Differences in temperature and moisture are also evident within the redwood's range along the coast from Oregon to Big Sur. The warmer and drier climate of Big Sur is probably responsible for the smaller size of Big Sur's redwoods, both as individuals and the forest in general. The redwoods in Big Sur, as large as some of them are, do not come near the size of the northern redwoods of Humboldt and Del Norte counties. Those giants may be the tallest trees in the world, the largest reaching 112 m (367 ft) in height (some Australian eucalyptus trees may be as tall or taller). The largest redwoods in Big Sur are 61 m (200 ft) tall and are found in the canyons and valleys on the coastal flank of the mountains, such as along the Little Sur and Big Sur rivers and in Partington, McWay, Big Creek, and Palo Colorado canyons. To the south, the trees become noticeably smaller. If the basic requirements of humidity and soil conditions are met, however, redwoods are extremely vigorous and competitive plants. They are not only the tallest of trees but are also some of the oldest, living longer than 2000 years. Black scars reaching far up the trees' trunks attest to their enduring many fires over the years. Their bark is fire resistant and can be as thick as 30 cm (12 in. ), while their wood lacks the flammable pitch and resins that allow many other conifers to burn quickly during a blaze. Redwoods also resist disease and wood-boring insects, thus the lumber is preferred where insect and rot damage is a problem. What remains of a tree that does succumb to a disaster, such as fire or logging, does not always die but often sprouts from its roots or stump in a process known as stump sprouting. The branches of a fallen tree or dormant buds grow straight up and send out new roots, becoming new trees as the parent log decays. Rings of younger trees often surround burned or logged stumps and are the shoots of those parent trees. As the young trees grow, the ring enlarges and these trees develop their own rings. The identity of the original ring is lost as the process is repeated. Redwoods most often reproduce this way, vegetatively, rather than sexually with their seed-bearing cones. Fire-resistence, stump-sprouting, and the subsequent rapid growth of young trees are several important ways in which redwoods shape and dominate their environment. Most of the hardwood trees competing for space with the redwoods, such as the tanoak (Lithocarpus densiflorus) and California bay, are less tolerant of fire and have a slower growth rate. These trees, although they can also stump sprout, are quickly outgrown by the redwoods and are eventually forced to live in the shade. Shading of the forest floor inhibits the growth of tree seedlings, and the deep layer of duff—organic material dropped by the trees—raises the soil acidity and also discourages competitive growth. Another adaptation of redwoods is their ability to withstand the flooding and silting that periodically occur in their canyon bottom habitat. Often after a severe summer fire, the following winter's rains wash soil and debris off the denuded slopes and into the redwood-filled canyons. Much of this soil is deposited in the flatter portions of the redwood groves, and in one storm several feet of mud and silt can bury the bases of the redwoods. In McWay Canyon at Julia Pfeiffer-Burns State Park, for example, the grove above the parking area was silted to a depth of several feet in the winter following the Rat Creek fire of 1985. Several tributaries of the Big Sur River channeled mudflows into the Big Sur Valley in 1972 and inundated redwoods there. Redwoods lack tap roots and have an extremely shallow root system. They instead develop a wide root horizon close to the surface. After burial by a mudflow, new redwood roots grow from the old root system toward the surface and out from the buried portion of the trunk. A new shallow root system is then established, and the old one, now well buried, is abandoned. Bay, tanoak, and other trees, in contrast, are often killed by silt deposition. Geologist Lionel Jackson excavated ancient redwood root horizons in Pfeiffer-Big Sur State Park to establish patterns terns of mudflows over time. By reading the patterns of root growth, he found that severe mudflows probably occurred in the park area at least three times between the years 1370 and 1700. Some common understory plants such as redwood sorrel (Oxalis oregana) (fig. 78) have also adapted to this cycle. When submerged by silt, they grow vertical shoots up through the layer and eventually reclaim their former habitat. Table 7 lists the trees and understory plants most commonly found in the Big Sur Redwood forest. Redwood forests can be divided into three main phases for a more accurate description: pure redwood, redwood-riparian, and redwood-mixed hardwood. The latter two types are essentially zones of overlap between redwood forest, riparian woodland, and mixed hardwood forest; these phases are widespread and consistent. Differences in exposure to wind and sunlight, availability of water, varying soil types, elevation differences, and disturbance history all play a part in shaping the composition of each phase. Pure Redwood Forest Many of Big Sur's coastal canyons, such as Partington Canyon and the Big Sur River valley, contain stands of pure redwood forest. These groves are not usually located directly along a large stream or river because sunlight can reach the forest floor through the open stream corridor. Instead, they are found on the moist, north-facing slopes of dark canyons or in small stream flats and protected bowls. In its purest form, this forest is characterized by a lack of plant diversity. Here the redwoods so thoroughly dominate that often nothing else can grow, not even the shade-tolerant sword fern (Polystichum munitum) (fig. 79) and redwood sorrel. The ground, nearly bare of understory, is covered with a duff layer several inches thick. The canopy overhead systematically filters out most of the direct sunlight, and the relative humidity and temperature are kept remarkably constant. The pure redwood forest contains some of the most magnificent and oldest redwoods, but sometimes a dense grove of young redwoods of uniform stature and age can also form a pure stand. Because the redwoods are so long lived, only severe natural or man-made disturbances can open up the forest to colonization by other plant species. On steep slopes, landslides open up patches of sunlit ground which may allow a tanoak, bay, or small shrub to move in. Fires perform the same function, but redwoods often bounce back and reclaim their territory before other species can become established. Redwood-Riparian Forest As the name implies, the redwood-riparian forest is restricted to the canyon bottoms where streams and rivers flow. This plant community is a melding of the redwood forest and the riparian woodland. The overall plant diversity is much greater here than in the pure redwood forest. The open stream corridor allows direct sunlight to infiltrate the forest floor, and additional moisture from the stream is available to plants along the banks. The hardwoods found here include the tanoak, western sycamore, white alder (Alnus rhombifolia), bigleaf maple, and California bay. The bay and tanoak trees grow interspersed with the redwoods, while the others line the stream where water and sunlight are most readily available. This forest often forms the picturesque scenes associated with the central California redwoods. Elegant, moisture-loving flowers such as leopard lily (Lilium pardalinum), crimson colombine (Aquilegia formosa), and Andrew's clintonia (Clintonia andrewsiana) line deep, clear pools. Elk clover (Aralia californica), western coltsfoot (Petasites palmatus), coast boykinia (Boykinia elata), horsetails (Equisetum spp. ), and several ferns give the pools a lush, almost tropical look. The riparian hardwoods, the leaves of which turn yellow and orange in autumn, contrast sharply with the towering green and brown redwoods. Just off the streambanks, this forest can have a dense and brambly understory of vines and shrubs that includes coffeeberry, poison oak, thimbleberry (Rubus parviflorus var. glutinosum), gooseberries (Ribes spp. ), and California huckleberry (Vaccinium ovatum), as well as the young saplings of tanoak and bay. Depending on moisture availability, there are often many species of ferns. Sword ferns and spreading wood ferns (Dryopteris arguta) (fig. 80) are common, while wetter areas near springs have venus hair (Adiantum capillus-veneris), maidenhair (A. jordani), five-finger (A. pedatum) (fig. 81), western chain (Woodwardia fimbriata) (fig. 82), and bracken (Pteridium aquilinum var. pubescens) (fig. 83) ferns. The flowers include western Solomon's seal (Smilacena racemosa) (fig. 84), western wake robin (Trillium ovatum) (fig. 85), redwood sorrel, redwood violets (Viola sempervirens), star flower (Trientalis latifolia) (fig. 86), and fairy bells (Disporum hookeri). Redwood-Mixed Hardwood Forest The third phase of redwood forest is redwood-mixed hardwood forest. This forest occurs on moist, north-facing slopes above the canyon bottoms where less light is available, and it represents a transition from a redwood forest to a hard-wood forest. Although conditions are drier up here, enough moisture is present for redwoods to grow with the hardwoods. The hardwoods adapt well to growing with the taller redwoods. Along the Tanbark Trail in Partington Canyon, for example, tanoaks grow almost as tall and narrow as the accompanying redwoods. California bay displays a similar tendency, while the coast live oak and madrone sometimes grow in patchy openings in and around the redwood stands. The understory here is usually shrubbier than that of the other two phases. There are many flowers, such as milkmaids (Cardamine californica) (fig. 87), hound's tongue (Cynoglossum grande), Douglas' iris (Iris douglasiana), and California saxifrage (Saxifraga californica), and shrubs such as poison oak, California coffeeberry, and gooseberries grow thick. The redwoods grow smaller and are less hardy near the tops of the slopes where moisture diminishes and exposure to wind and sun becomes more severe. The hardwoods, in contrast, become more numerous, and the redwoods eventually give way to a mixed hardwood or mixed evergreen forest. At first glance, the redwood forest seems quite devoid of animal life. The groves are unusually quiet. Aside from the occasional cries of the Steller's jay (Cyanocitta stelleri) (fig. 88), there is little bird chatter or insect noise. This absence is most noticeable in the pure redwood forest, where the understory has few seed-bearing plants to attract herbivores and their predators. Also, one of the most common understory plants, the redwood sorrel, is toxic to grazing animals and is avoided. What the redwood forest lacks in diversity, however, it makes up for with a moist and stable microclimate relished by a few notable animals. The banana slug (Ariolimax columbianus ssp. stramineus) (fig. 89), for example, would perish in the hot chaparral or grassland during the heat of the summer but instead finds a suitable habitat here year-round. This bright yellow gastropod is one of the redwood forest's most visible inhabitants. It is related to the intertidal snails described earlier in this book, but its shell has been reduced to a tiny fragment hidden in its mantle. This lack of a shell explains the banana slug's need to stay in its moist environment since the shell is used by snails to lock in body moisture during dry periods. Shells also provide snails with a measure of protection from predators, but banana slugs have developed another strategy. Their bodies secrete chemicals that are extremely distasteful, and the slug's bright yellow coloration advertises this fact to would-be predators. Thus, they are usually left alone to graze on the vegetation and fungi littering the forest floor. Several amphibian species also prefer the moist habitat of the red-wood forest. Salamanders are seen in other habitats, even the grassland if the season is wet enough, but they are most readily observed in or near the redwood forest. They belong to the family Plethodontidae, all members of which are lungless. Oxygen is absorbed directly through their thin, moist skin. Consequently, water evaporates rapidly through the skin and is lost, and any drying of the skin inhibits the animals' ability to breathe. (Some amphibians also use buccal respiration, a process by which they gulp air and then absorb oxygen through the linings of the mouth and throat.) As with the banana slug, these salamanders depend on the redwood forest's moist microclimate for their survival. Probing beneath fallen wood or duff often uncovers a red salamander (Ensatina eschscholtzi), a slender salamander (Batrachoseps pacificus), or a Coast Range newt (Taricha torosa) (fig. 90). The Coast Range newt is essentially a terrestrial (land-based) salamander that returns to water only to breed. Like all salamanders, it is similar to a lizard in body form but has no claws, and it also has only four toes on its front feet while lizards have five. The Coast Range newt seeks refuge beneath leaf litter, downed wood, or in the burrows of other animals to stay moist in dry weather. Large numbers of these newts can be seen traveling to their breeding sites after a rainstorm, and they are common in streams in the springtime. We saw numerous Coast Range newts in the Big Sur River, in Lost Valley Creek, and in the Arroyo Seco River in May. Breeding males have smooth skin and a flattened tail, while all others have warty skin and a round tail. The glands on the skins of newts exude potent poisons to discourage predators, and they should be handled with caution. Newt larvae have a set of feathery gills that they use to breathe in the water during their first year of life. Near the end of that time, they develop lungs and rise to the surface of the water to breathe. Once they leave the water they return annually only to breed. Red salamanders, distinguishable from newts by the prominent grooves on their backs and sides, are entirely terrestrial salamanders. They are usually reddish brown on the back and white or light orange on the belly, are 15 cm (6 in.) long from head to tail, and have a noticeable constriction at the base of the tail. They have smooth skin and large dark eyes. They, too, spend most of their time hidden under debris, but need not return to water to breed. These lungless salamanders breathe entirely through their skins and the lining of their mouths. The slender salamander is much thinner and smaller, and resembles a worm with four tiny legs attached to its body. Both salamanders become active with the first rains in October or November and remain so until April or May. They are carnivorous and feed on sowbugs, worms, centipedes, spiders, and ground-dwelling insects. A few lizards are sometimes seen in the drier, sunnier portions of the redwood forest, including the alligator lizard and the ubiquitous western fence lizard. Snakes are also seen, especially near streams or in the redwood-mixed hardwood forest. The uncommon and secretive sharptailed snake (Contia tenuis) feeds almost exclusively on slugs, including the noxious banana slug. It is most active in the spring, when its prey is out and about. The species nears the southern extent of its range in Big Sur. It is most likely to be seen at night or after rain. Food for the birds, in the form of insects and seed, is scarce here compared with most of the other plant communities. Nevertheless, this forest is the preferred habitat of two interesting but inconspicuous species, both of which seem to fit in well with the overall character of the redwood forest. The winter wren (Troglodytes troglodytes) (fig. 91) is a tiny bird with a pleasing song. It is more often heard than seen in the tangled shrubs and brambles of the darkest redwood forests, where it builds a nest of moss in the exposed roots and rocks along the steep streambanks. The brown creeper (Certhia americana) (fig. 92) is slightly larger than the winter wren and depends directly on the redwood and other trees for its livelihood. It builds its nest behind loose strips of bark on tree trunks, where it also feeds on insects found in the cracks and crevices of the bark. It creeps up a tree trunk in a spiral pattern, poking its thin, curved beak into the bark as it climbs. A more conspicuous bird of the redwoods is the Steller's jay. With raucous out-bursts it alerts the rest of the area to any unwanted intrusions, be they hawk, owl, or human. It is an omnivorous feeder, eating seeds, acorns, and insects as well as the eggs and young of smaller birds. Other occasional nesters in the redwoods include Pacific slope flycatchers (Empidonax difficilis), dark-eyed juncos (Junco hyemalis), and acorn woodpeckers (Melanerpes formicivorus). The woodpeckers nest in the dead crowns of redwoods, where they also locate their granaries of stored acorns. Birds that are seen foraging in and around the redwood forests include varied thrushes and hermit thrushes (Ixoreus naevius and Hylocichla guttata), American robins (Turdus migratorius), chestnut-backed chickadees (Parus rufescens), downy woodpeckers (Picoides pubescens), and common flickers (Colaptes auratus). Other birds, such as band-tailed pigeons (Columba fasciata) and certain owls and hawks, often roost here. Observation of raptors, especially the great horned owl (Bubo virginianus), is relatively easy in these woods due to the open spacing of tree limbs. The owls prey upon the shrews and mice that are active at night. The trowbridge shrew (Sorex trowbridgii,) (fig. 93), a mouselike creature about 10 cm (4 in.) long, pushes through the damp redwood litter in search of insects, sowbugs, and worms. Shrews are the smallest mammals and have a correspondingly high metabolism. They are sometimes seen running frantically about the forest floor, where they must eat at least their own weight in food every day or die. During this high-paced search for food, they attack insects, spiders, worms, and even small mice, and they are one of the few mammals with venom. The shrews' above-ground habits make them the common targets of larger predators such as snakes, owls, and foxes. Another small mammal found here is the broad-handed mole (Scapanus latimanus). Moles are extremely well adapted to life underground. They have eyes the size of pinheads and no external ears. At the expense of these organs, they have instead developed sensitive snouts for locating prey. Their tails are tactile, and their fur is napless, allowing it to be brushed equally well in either direction; these features enable moles to travel forward or backward in their tunnels. The tunnels, which are visible as long ridges of raised ground, are dug with powerful forelimbs that have large palms. Barbour, M. G., and J. Major, 1988. Terrestrial vegetation of California. 2d ed. California Native Plant Society. Special Publication no. 9. Bickford, C., and P. Rich, 1984. Vegetation and flora of the Landels-Hill Big Creek Reserve, 2d ed. Environmental Field Program Publication 15, University of California, Santa Cruz. California Native Plant Society, 1988. Inventory of rare and endangered vascular plants, Special Publication #1, 4th ed. Berkeley. Crampton, B., 1974. Grasses in California. California Natural History Guide 33. Berkeley: University of California Press. Engles, E., ed. 1984. The natural features of the Gamboa Point Properties, Monterey County, California, Vol. 1. Environmental Field Program Publication 13, University of California, Santa Cruz. Griffin, J. R., 1971. Oak regeneration in the upper Carmel Valley, California. Ecology, 52: 862-868. Griffin, J. R., 1973. Valley oaks: The end of an era? Fremontia, 1(1): 5-9. Griffin, J. R., 1975. Plants of the highest Santa Lucia and Diablo range peaks, California. U.S.D.A. Forest Service Research Paper PSW-110. Berkeley: Pacific Southwest Forest and Range Experiment Station. Griffin, J. R., 1976. Regeneration in Quercus lobata savannas, Santa Lucia Mountains, California. American Midland Naturalist 995(2): 422-435. Griffin, J. R., 1980. The natural history of Hastings Reservation. Unpublished manuscript on file at University of California Hastings Natural History Reservation, Carmel Valley, California. Griffin, J. R., and W. B. Critchfield, 1976. The distribution of forest trees in California. U.S.D.A. Forest Service Research Paper PSW-82. Berkeley: Pacific Southwest Forest and Range Experiment Station. Head, W. S. 1972. The California chaparral. Healdsburg, Calif.: Naturegraph Publishers. Howitt, B. F., and J. T. Howell, 1964. The vascular plants of Monterey County, California. The Wasmann Journal of Biology, 22(1): 1-184. Kruckeberg, A. R., 1984. California serpentines: Flora, vegetation, geology, soils, and management problems. Berkeley: University of California Press. McMinn, H. E., 1974. An illustrated manual of California shrubs. Berkeley: University of California Press. Mooney, H. A., and F. diCastri, 1973. Mediterranean-type ecosystems. Berlin: Springer-Verlag. Munz, P. A., and D. D. Keck, 1968. A California flora and supplement. Berkeley: University of California Press. Neihaus, T. F., and C. L. Ripper, 1976. A field guide to Pacific states wildflowers. Boston: Houghton-Mifflin. Raven, P. H., 1966. Native shrubs of southern California. California Natural History Guide 15. Berkeley: University of California Press. Ray, D. G., 1966. Silvical characteristics of redwood. U.S.D.A. Forest Service Research Paper PSW-28. Berkeley: Pacific Southwest Forest and Range Experiment Station. Shreve, F., 1927. The vegetation of a coastal mountain range. Ecology, 8: 27-44. Stebbins, G. L., 1978. Why are there so many rare plants in California? Part 1. Environmental factors. Fremontia, 5(4): 6-10. Talley, S. N., 1974. The ecology of the Santa Lucia fir (Abies bracteata), a narrow endemic of California. Ph.D. Thesis, Department of Botany, Duke University, Durham, N.C.
White, K. L., 1966. Structure and composition of foothill woodland in central California. Ecology, 47: 229-237. White, K. L., 1967. Native bunchgrass (Stipa pulchra) on Hastings Reservation, California. Ecology, 48: 949-955. Each year millions of people visit the area of rugged California coastline and wild mountains known as Big Sur. Finally here is a book that is both a natural history of this beautiful region and an excellent guide to its extensive public lands. The first section introduces the area's geology, climate, flora, fauna, and human history. The second section describes selected sites, trails, and features that are mentioned in Part One. Although Big Sur is world famous for awe-inspiring scenery, it is less known for its great ecological diversity and its significance as a haven for many species of terrestrial and marine wildlife. In no other part of the world do fog-loving coastal redwoods thrive on one slope of a canyon while arid-climate yuccas grow on the other. Similarly, sea otters and cormorants live near dry-climate creatures like canyon wrens and whiptail lizards. The area's staggering beauty and forbidding wilderness have inspired artists, poets, naturalists, and hikers—and also real estate developers. As increasing tourism, development pressure, and land-use decisions continue to affect Big Sur, this book will do much to heighten awareness of the region's biotic richness and fragility. Written in nontechnical language, with generous color photographs, drawings, maps, species lists, and a bibliography, it will attract both the casual and the serious naturalist, as well as anyone concerned about preserving California's natural heritage. Paul Henson is a wildlife biologist with Scientific Resources, Inc. in Portland, Oregon. Donald J. Usner is an environmental consultant in New Mexico. 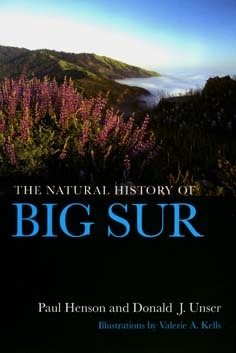 This book took shape while both were working in Big Sur. Valerie A. Kells, a freelance illustrator in Virginia, has a degree in Natural History and was part of this project from its start.